The next step to examine the StaticSendPortOrchestration and DynamicSendPortOrchestration structure and the code of the helper classes used by the orchestrations. This topic covers the orchestration structure and the component code used by the orchestrations. 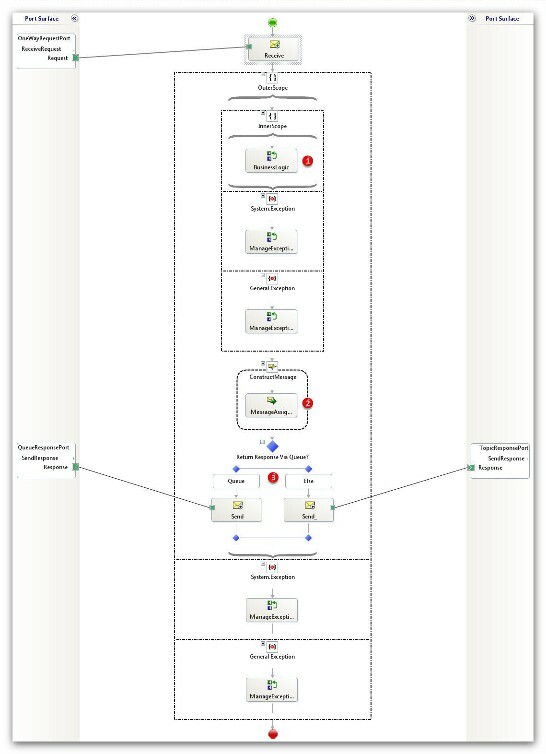 The DynamicSendPortOrchestration shows how to implement an asynchronous, request-response pattern where the client application dynamically specifies the queue or topic address to send the response message. For brevity, the RequestManager helper component description is omitted because its code is unnecessary for the understanding of the solution. Invokes the SetResponse method on a ResponseManager object to assign the stream that contains the payload to the response message. Copies the context properties from the request to the response message. Assigns a value to the Application context property. Using the Application context property demonstrates how a BizTalk application can send context information out-of-band to another application through a Service Bus message. In Step 4: Configure the Send Ports, the static send ports are configured to translate the Application context property into a user-defined property of the outgoing BrokeredMessage. Creates a MessageId for the response message. Copies the MessageId from the request message to the CorrelationId of the response message. This copy allows the client to correlate the response message with the initial request. Copies the ReplyToSessionId from the request message to the SessionId of the response message. Using sessions is necessary when multiple consumers use the same sessionful queue or subscription to receive response messages. In this case, a publisher application can use the ReplyToSessionId property of a BrokeredMessage to communicate to the consumer the value to assign to the SessionId of response messages. At Point 3, the Queue rule of the code snippet invokes the ReturnResponseViaQueue method of the RequestManager object; which returns true if the value of the ReplyTo context property contains the word “queue”. Otherwise, it returns false. In other words, the orchestration checks the value of the ReplyTo context property that contains the address specified by the client in the ReplyTo property of the BrokeredMessage. It chooses whether to send the response message to the responsequeue or responsetopic, based on the client demand. Invokes the GetAction method on the ResponseManager object to get the WCF.Action value. Specifies the NetMessagingBinding as WCF.BindingType for the dynamic send port. Assigns false to the WCF.EnableTransaction property. Invokes the GetBindingConfiguration method on the ResponseManager object to get the value for the WCF.BindingConfiguration. 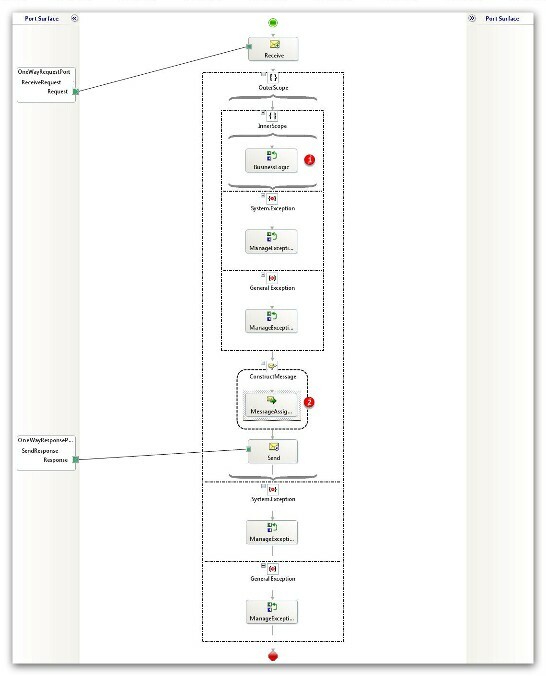 Invokes the GetEndpointBehaviorConfiguration method on the ResponseManager object to get the value for the WCF.EndpointBehaviorConfiguration. Invokes the GetReplyTo method on the ResponseManager object to get the address of the dynamic send port. Sets the TransportType of the dynamic send port to WCF-Custom. /// This class contains helper methods used by the orchestrations. /// Sets the content of the XLANGMessage passed as first parameter. /// Gets the action for the response request. // information. In addition, this data should be cached to improve performance. /// Gets the binding configuration for the response request. // Return default binding configuration. /// send port used to send out the response request. // Return default endpoint behavior configuration. /// Gets the value of the MessageId context property. /// Gets the value of the ReplyTo context property. /// Gets the value of the ReplyToSessionId context property.